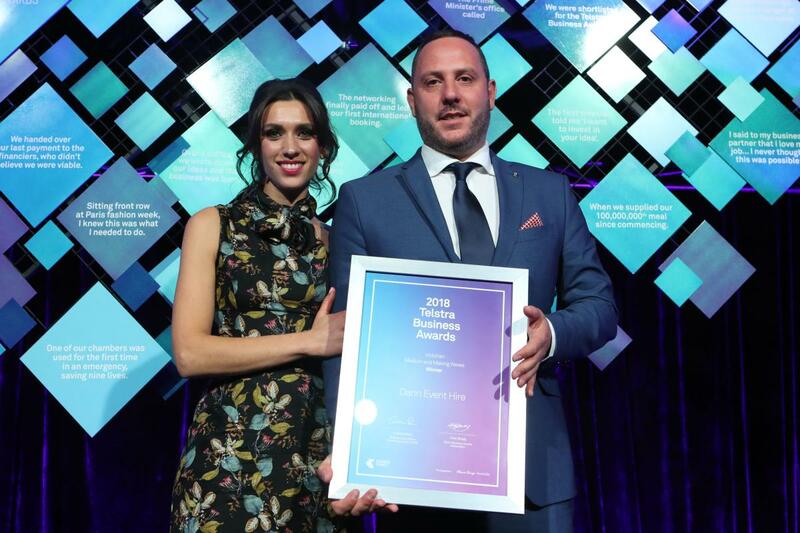 As a testament to the hard work and dedication, Dann Event Hire was named the Telstra Victorian Business of the Year in the Medium and Making Waves category. Francesca and Nick reflected on that moment - that special, stand-out moment from their business journey. Moments that have been the most significant, the most magical, the most important, or the most memorable. ‘That moment was when we signed the lease to extend our 18,000 sqm warehouse space in Cawley Road Brooklyn on top of the 3,500 sqm warehouse space in North Melbourne. It was the moment that signified the sheer size of our operations and the responsibility we had for our 150 staff. With 48 trucks in our fleet, 50,000 pieces of stock in our warehouse, 27 chair varieties, 82 variations of marquee structures, 3,329 teaspoons, we realised it wasn’t just the two of us anymore!,’ says Nick Gulino. Dann Event Hire is involved in some of Australia&apos;s other most widely recognised hallmark events such as the Australian Open, Australian Formula 1 Grand Prix and Melbourne Cup Carnival. Next year, they will bring to life the Twilight Beach Polo at St Kilda West Beach in February 2019. ‘Equally, we are proud to work with bridal couples, families and organisations big and small, to bring their dreams and brands to life,’ says Francesca Pavone. ‘We are invested in our industry, our clients, our staff and our brand. There is nothing more we love than to work hand in hand with our clients to re-imagine spaces to excite and inspire. This is not a job for us. We do what we love. We are here to put a dent on the universe and leave our legacy,’ adds Francesca Pavone. Additionally, Nick and Francesca have recently purchased Tussie Mussie Vineyard Retreat in Red Hill on the stunning Mornington Peninsula. A 27-acre private estate with 3 separate homes. It is an ideal location for a weekend getaway, wellness retreat, small private celebration or alfresco dining experience. Dann Event Hire was involved in 3,788 events in 2017 alone with the number expected to top over 4,000 in 2018.